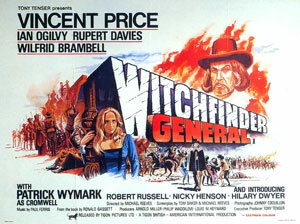 As the titular unscrupulous witch hunter, Vincent Price gives one of his most malevolent and restrained performances. Writer/director Reeves, who died from an overdose less than a year later at the age of 26, uses the 17th century English Civil War setting as a screen, onto which he can project themes – questioning the caprices of authority, illustrating the brutal and repressive lengths a regime will to go in order to stay in power, entertaining the suspicion that base hypocrisy lurks behind fervent religiosity – resonant with the contemporary counterculture. Sporting some of the most hare-brained schemes ever encountered in a “mad doctor” film, this late entry in the English Gothic horror cycle provokes gales of unintentional laughter, particularly the spectacle of Robert Stephens’ lisping histrionics. Anachronisms abound. (Who knew home theaters were even possible in 1875…?) Scientific processes, so integral to the unfolding plot, remain cryptically unexplained. Only infrequently, the widescreen Scope cinematography provides something worth looking at. Based on factual events, this docudrama about the kidnapping and murder of a small band of Trappist monks living in Algeria, while attuned to the daily rhythms of monastic life, and occasionally providing tableaux of ravishing natural beauty, seems primarily concerned with providing a religious-ethical explanation for why the monks remained, knowing full well, as tensions (and violence) mounted, what their inevitable fate must be. Of Gods and Men argues for religious moderation by placing its monks amidst a local population that wants and needs their continued presence, while never making more than a nominal effort to explore the indigenes or their folkways. Boils down to cinema as martyrology. Gaudy and wildly inventive, Demme’s mafia screwball comedy may ring hollow at its core (the story satisfied to do nothing more than sound variations on a well-worn theme), but the comic set-pieces are dazzling, always amusing, occasionally riotous. While both films examine the viewpoints of social outsiders, there’s far less at stake here in the realm of social satire than in Demme’s previous film, Something Wild (1986), and less attention to the finer shades of character motivation. A would-be rumination on urban isolation and emotional disconnect, this inflatable-doll-comes-alive riff on Pinocchio by way of the insufferable Amélie (2001) is mostly full of hot air. Koreeda’s whimsical fairytale goes on far too long, crowded with monotonous scenes of the now-human Nozomi reacting with wonderment to her surroundings, and largely fumbles the meta-cinematic possibilities presented by having her find a job at a local video store. Sporadic touches of humor are appreciated, but eventually make the viewer wish for a defter thematic touch, and even a third-act plot development that somewhat darkens the mood eventually goes nowhere. Largely dialogue- and plot-free, and often shunting producer/star Steve McQueen to the sidelines or background for long stretches of screen time, nevertheless this well-crafted attempt to recreate the visceral thrills of an automotive endurance test modestly succeeds. In fact, it’s precisely Katzin’s decision to de-dramatize events that permits Le Mans to work at all. McQueen’s single “monologue” reveals the film’s existential underbelly: “A lot of people go through life doing things badly. Racing’s important to men who do it well. When you’re racing, it’s life. Anything that happens before or after… is just waiting.” Infinitely preferable to the cacophonous claptrap of, for instance, Tony Scott’s Days of Thunder (1990). Late-period film noir benefits immeasurably from the expressionistic mise-en-scène of cinematographer John Alton. Spinster Barbara Stanwyck watches from her bedroom window as author/Nazi apologist George Sanders murders a woman. (Witness continues an annoying trend in American films that simplemindedly links Nazism to the philosophy of Friedrich Nietzsche.) Machiavellian Sanders arranges it so that nobody, even the police detective who falls for her, believes a word Stanwyck’s saying; in a sequence that just might have influenced Samuel Fuller’s Shock Corridor (1963), Sanders even manages to have her briefly committed to an asylum. Released several months ahead of Hitchcock’s similarly-themed Rear Window. Hawks’ distaff variation on The Front Page (1931) stands as one of the finest classic screwball comedies. Leads Cary Grant and Rosalind Russell throw off sparks. The dialogue flies fast and furious – Hawks had the sound mixer flipping overhead mikes on-and-off at an equally frantic pace, sometimes as many as 35 times per scene, in order to capture the fragmented, overlapping quality he desired. Below the glossy surfaces of madcap entertainment, writers Ben Hecht and Charles MacArthur manage to work in serious points about political corruption and the abuse of power. And then there are the unexpected self-reflexive gags (improvised, by all accounts): When Grant sics a floozy on Russell’s fiancé Bruce Baldwin (Ralph Bellamy), he lets her know that Baldwin looks like “that fellow in the movies…you know, Ralph Bellamy!” Or the bit where Grant mentions the inglorious fate of the last fellow who crossed him, one Archie Leach (Grant’s birth name). In this idealistic plea for camaraderie between nations, the story of German and French miners pulling together to rescue colleagues trapped by fire and cave-in, Pabst combines the aesthetics of the two major strands of 1920s German cinema, the stark monochrome visuals employed by German Expressionism along with the documentary-like naturalism evident in the New Objectivity, captured by celebrated cinematographer Fritz Arno Wagner. Some prints (not the one shown on TCM) conclude with an ironic coda, in which French authorities rebuild an underground iron fence that marks the border between countries, signifying a return to narrow-minded nationalism. Kiss of Death belongs to Richard Widmark, making his screen debut as the giggling, maniacal gunman Tommy Udo. Neither hardnosed DA Brian Donleavy nor two-bit hoodlum Victor Mature (more inexpressive than usual) manage to hold the screen alongside Widmark. Essential viewing, even if for nothing other than the scene where a chortling Widmark shoves a wheelchair-bound old woman down a flight of stairs. The code-of-honor storyline is entirely beside the point, especially since the film wants it both ways, asking the audience to sympathize with Mature when he stands firm on not squealing and then when he flip-flops, turning state’s evidence like a prize stool pigeon. This entry was posted in film, movie reviews and tagged air doll, alfred hitchcock, amelie, barbara stanwyck, ben hecht, brian donleavy, cary grant, charles macarthur, cinema, cinema reviews, days of thunder, film, film criticism, film review, film reviews, g. w. pabst, george sanders, henry hathaway, hirokazu koreeda, his girl friday, howard hawks, jonathan demme, kameradschaft, kiss of death, le mans, lee h. katzin, married to the mob, michael reeves, movie, movie reviews, movies, of gods and men, ralph bellamy, rear window, richard widmark, robert newbrook, robert stephens, rosalind russell, roy rowland, samuel fuller, shock corridor, something wild, steve mcqueen, the asphyx, the front page, tony scott, victor mature, vincent price, witchfinder general, witness to murder, xavier beauvois. Bookmark the permalink.